Looking for a Mechanical Bull? We rent mechanical bulls, mechanical rodeo bulls, mechanical bull riding and bucking bull machines for special events, school carnivals or just a good old time. Mechanical Bull rentals in Northern California. 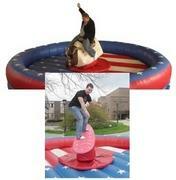 Call today to rent a mechanical bull for your next event! on our bull at their private, family PARTY! So when your ready to step out from the herd, Give us a holler!